Sherry wines are recovering new ground in the wine world, and it is well deserved. Sherry has a long history of serving the likes of Christopher Columbus to Shakespeare and has recently been previewing new spotlights for its stellar value and food-friendly behavior in our modern world of wine. Getting down to brass tacks, Sherry is a fortified wine, produced in southwest Spain's "Sherry Triangle." This triangle consists of the three sunny towns of Puerto de Santa María, Jerez and Sanlúcar de Barrameda. The Palomino and Pedro Ximénez grapes are the primary grapes used to make Sherry. The soil in this region is chalky, limestone-based and provide the perfect conditions for growing the Palomino and Pedro Ximenez (PX for short) grapes that are used in making the world’s finest Sherries. Once harvested and fermented, the wines fate is then decided — will it become a Fino or an Oloroso? The two predominant types of Sherry are Fino (very dry with a lighter body) and Oloroso (still dry but much richer in both flavor and body). 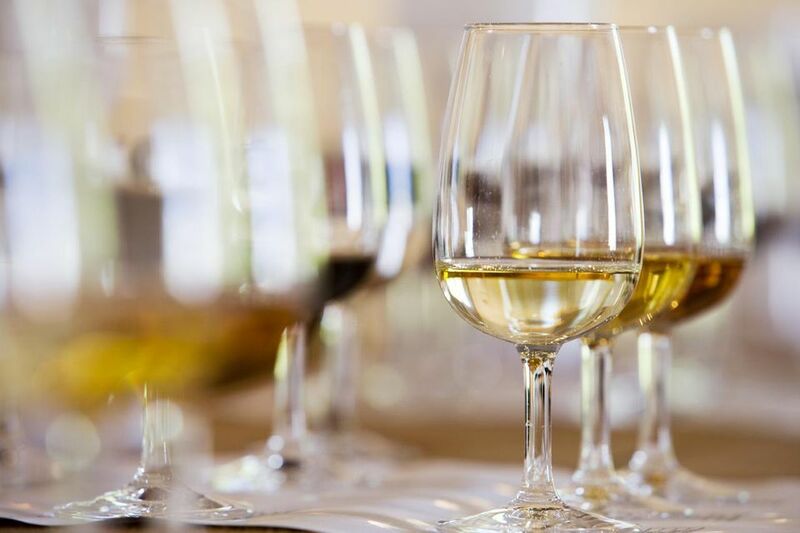 If the winemaker is going for Fino, alcohol is added (fortification) until it reaches just over 15%; however, if Oloroso is the goal then alcohol is added to reach an 18% alcohol content. Now the fun begins while the wines remain in their casks they are permitted contact with air in the top portion of the cask. A layer of yeast called "flor" forms a coating on the surface of the Sherry, keeping the wine from over-oxidizing — these wines will become Finos as their lower alcohol content is what allows the yeast to grow in the first place. Olorosos, on the other hand, do not support the growth of flor due to their higher alcohol content. Olorosos are permitted to oxidize intentionally, producing a darker, and richer wine with more body than a Fino. Sherry wines must go through a solera system for adequate aging. This system is essentially a blending system of casks that hold wines of different ages. The oldest casks of Sherry are the ones that are bottled in a given year and the next casks are arranged in such a way that the youngest Sherries are blended into a series of casks holding progressively older Sherries. The blending off of younger Sherry into older Sherry results in very consistent, high-quality wines that all share a portion (albeit small) of the oldest original vintage of Sherry made at the bodega. Sherries do not have a vintage date per se, as they are really a blend of many years. Fino - Very dry, light-bodied Sherry that is straw-like in color. The characteristic aromas associated with Finos are almonds. Typically Finos comes in at about 15 to 17% alcohol by volume. Fino tastes amazing with almonds, olives, ham, and chips and dips. Manzanilla - Also dry, and pale in color. Manzanilla is a "fino" style of Sherry made in Sanlucar and best with seafood and tapas. Amontillado - In between Fino and Oloroso in terms of color and body. This off-dry Sherry loses its flor during the aging process and yields deeper color and a lovely nutty flavor. The characteristic aromas associated with Amontillados are hazelnuts. This Sherry is great with oily fish and chicken dishes. Oloroso - Dark in color, rich in flavor. Olorosos typically have a remarkable walnut aroma and a swirled caramel flavor making them a top pick for rich meats and flavorful cheeses (consider Manchego, a delicious Spanish cheese made from sheep's milk). Palo Cortado - Is a very rare Sherry that begins life as a Fino (where the yeast develops) and progresses to an Amontillado (where the flor dies off) but ends up with the richer style of an Oloroso. This Sherry has a dry palate and an enchanting reddish-brown color combination with dramatic aromas and full flavor. Sweet Sherry - Is a Sherry that has been sweetened with Pedro Ximénez (PX) grape juice. Pedro Ximénez grapes have a high residual sugar content as they are sun-dried (think raisins) to concentrate the sugars before being pressed. Flavors that one can expect from PX are the thick, sweet flavors of fig and molasses. Cream Sherry - Rich mahogany in color and velvety smooth in texture, a sweet Sherry made from Amontillado or Oloroso and sweetened with PX. Perfect with cheesecake. Pedro Ximénez - Is an ultra sweet almost syrup-like dessert Sherry, made from sweet, sun-dried grapes of the same name. Its alcohol content is on the lower end of the spectrum and its flavor profiles lean towards the toffee, fig, date and molasses side of the vine. I had the Osborne Pedro Ximénez Viejo over vanilla ice cream and it was unbelievable, better than any dark chocolate or caramel sauce you can find! All Sherry should be stored upright in a cool, dark place. Finos and Manzanillas are not long lifers and should be consumed fairly quickly after bottling. Once they have been opened, keep them stored in the refrigerator to prolong their life up to around two weeks. Serve them chilled. Amontillados can keep for 2 to 3 years in a sealed bottle and again once opened should be consumed within a couple of weeks (keep in refrigerator to prolong life). Serve chilled or at a crisp room temperature. The Olorosos, sweet and cream Sherries and the Pedro Ximénez Sherries can all be stored for many years as they have more age and weight on them. You don't have to store these guys in the refrigerator after opening (but you may); just keep them in a cool, dark storage location (a basement is ideal). Serve at room temperature. Alvear, Bodegas Dios Baco, Emilio Lustau, Gonzalez Byass, Hidalgo, and Osborne.